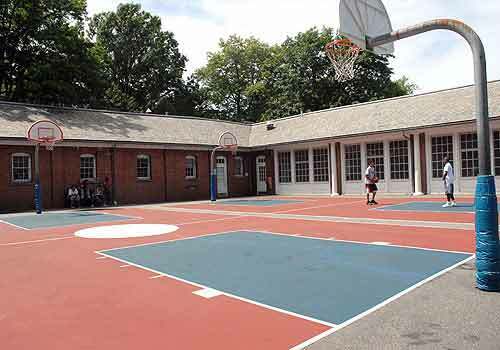 The North Meadow Recreation Center, which is at the south end of the meadow, was converted to a recreational facility in the early 1990s and underwent a second refurbishment in 1998. The exterior of the building was preserved to protect its landmark status, and the interior now has a community room used for classes, gatherings, and recreational activities; and basketball and handball courts. Following these extensive renovations, the 12 fields for baseball, softball, and soccer reopened for permitted use in the spring of 2000. A variety of approaches is used for in the elementary, middle school, and high school programs and serve local schools and community board organizations. The Center loans field day kits with the presentation of a photo ID. Visitors can borrow a kit with a variety of balls, bats, frisbees, and jump ropes. In the spring of 2006, the Central Park Conservancy constructed a new Soil, Water, and Ecology Lab at the North Meadow Recreation Center to monitor the soil and water in Central Park more closely. Outfitted with completely new equipment, the Lab tends to the specific biological and chemical needs of the Park. Groups: Reservations are required for Pitch In, Pick Up and Field Day Kits for groups of 5-30 people. Request a Group Reservation.